Jelly Belly Jar Gourmet edibles. 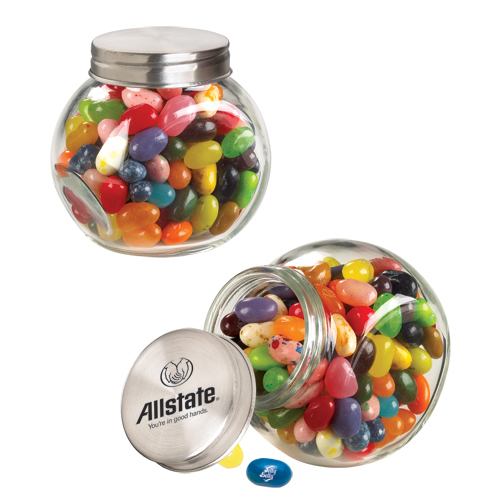 A great way to decorate your desk with this colorful and delicious treats.Each glass jar is filled with 6 ounces of Jelly Belly brand jelly beans. Turn the page towards success for your business when you introduce this apothecary jar! It measures 2 3/4" x 2 3/4" x 2 3/8", but doesn’t come blank - it comes with 4 oz. of delicious Jelly Belly (R) jellybeans. The colorful candy is enough to draw the eyes of your customers, but they trust your brand. So add your imprint of your company name or logo to make it an easier choice to pick up over your competitors! 3.25" x 3.25" x 2.35"
Bulk / 40 lbs / 50 pcs. / 18 x 14 x 8box.